In the early days of precast concrete landscaping materials, contractors and homeowners were limited to small hand-held units (typically 4” x 8” x 60mm) and standard grade patio slabs (typically 24” x 24” x 22mm). However, concrete slabs and pavers have had to evolve to meet the needs of growing industry standards and design trends. Inevitably, so too have the installation tools used for handling these innovative products. In fact, technological improvements in manufacturing coupled with outdoor fashion trends have cultivated a large assortment of sizes and styles of concrete slabs. As in any industry, trends have been met with eyebrow raising concerns. My personal favorite being, how in the world do I install a 600mm X 600 mm X 100mm thick 183 lbs unit without damaging the unit and most importantly hurting myself? 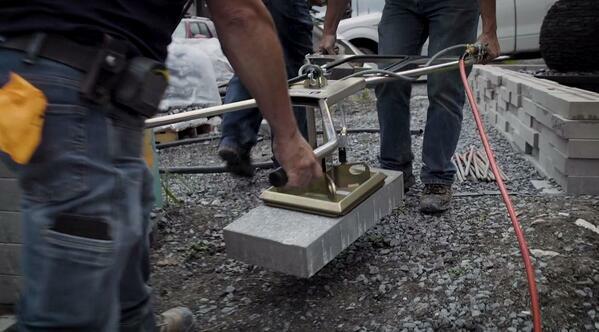 Concrete slabs are here to stay. However, your team won’t be without the right tools. In an industry currently suffering from a labor shortage, you can’t afford that. Modern laying tools with built-in vacuum suction are now amongst the most used in the industry. After all, they greatly increase installation speeds for large units (their light weight and ergonomic design greatly reduces fatigue and injury). These vacuum systems fall into two camps; hand-operated and machine-operated. Last summer, we embarked on the construction of the project we presented at our Contractor Showcase events this winter. Since we were facing a tight deadline, we took measures to transform two-day jobs into a single-day job. 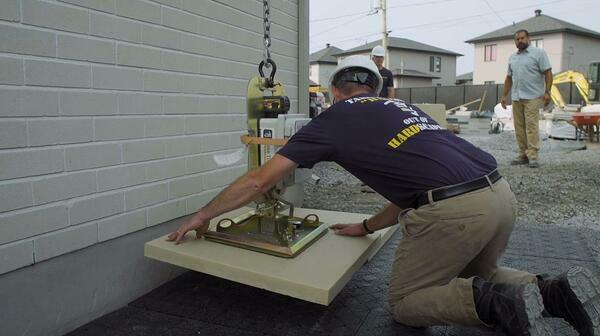 Equipping our team with concrete slab lifters from Pave Tool worked to our advantage. 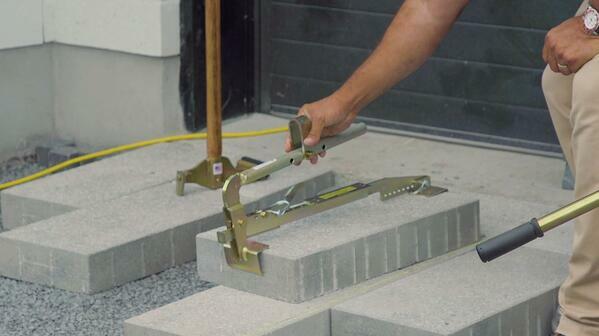 Pave Tool Innovators has been making hardscapers’ lives easier since 1985. Amongst their impressive array of landscaping tools, you can find interchangeable slab laying systems like the slab lifter. 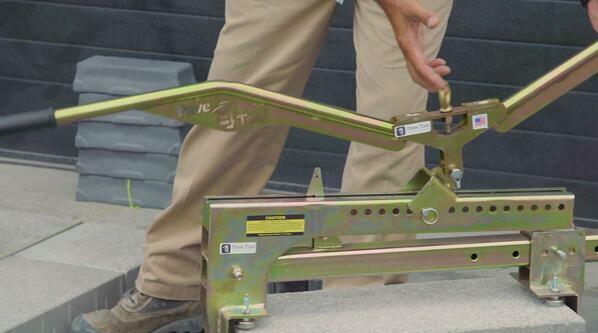 The small slab lifter can be hand-operated by one or two persons and can also be mechanically laid. Their large slab lifter is typically handled by two people or mechanically laid. If you wish to build your own kit, you will be pleased by their Elite Suction System. You will only buy the team or project-specific tools. No money wasted there. 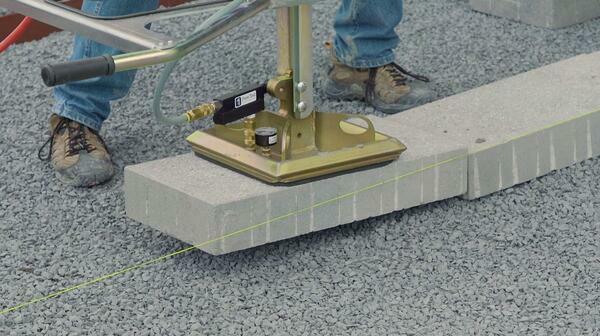 The basic kit is battery-powered, perfect for laying our Aberdeen, Travertina Raw, Inca or Dunes concrete slabs. No hoses, no hassles. If you choose the all-inclusive kit, you will be able to lift all Techo-Bloc products, including the members of our Industria 600 series paver family. While paving the driveway of our showcase project, those heavy 12" x 24" x 4" units could have slowed us down. Providing our team with slab lifters kept us on track. Our customer wanted their new walkway to be paved with our Travertina Raw 30 x 30 concrete slabs, the biggest paving stones we produce at Techo-Bloc. However, the bigger they are, the harder they are to move around. It became obvious we needed additional support to keep our guys safe and maintain a high productivity rate. Thanks to the Pave Tool Innovators Elite Suction System, we were able to flip those heavy concrete slabs from vertical to horizontal with ease. Innovative battery-powered vacuum equipment made a positive change to the slab laying game. A back-breaking manual labor becomes a simple communication between the equipment operator and the team. NEED MORE TIPS TO KEEP YOUR CREW ON THEIR FEET? CONSULT WITH OUR EXPERTS TODAY!